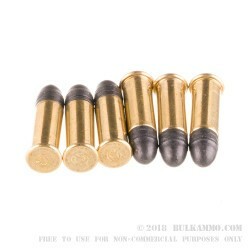 Quiet, fun to shoot .22 Long 29 grain cartridges that will quickly fire out of a .22LR, but have a special place in the nostalgia of shooting in modern America. 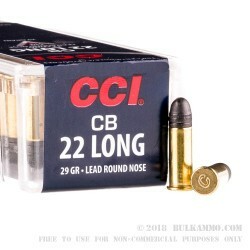 .22Long is a classic cartridge that is used in lever actions, bolt actions and semi autos from the 50’s, 60’s and 70’s that we all remember shooting. The cartridge has a reputation for being small, cheap, quiet and effective for general small ground game hunting in rural America. Who doesn’t remember taking out the old rifle into the backyard or the woods and shooting all day long going after squirrels and birds? 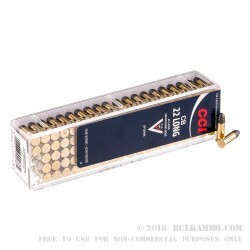 For when you need a quick, quiet end to the gopher problem out back or the squirrels eating your pumpkin patch, .22Long is the perfect solution. Introducing the little ones to shooting? Using a lightweight comfortable tube fed rifle in .22Long is the perfect solution. Note: the reduced power and velocity of this round which gives it the great lower noise benefits makes it unable to cycle most semi-autos – even those chambered in .22Long. This is because the round is produced specifically to have a reduced power level. 710 feet per second out of the muzzle and 32 ft. lbs of energy, makes this much more potent than pellets, but nearly as quiet. Q: I have a 22 rifle that has a 26" barrel and is their any chance of this product getting stuck in that long of a barrel? A: First, be sure that your rifle is chambered for .22 Long, and not .22 Long Rifle. Second, while it is not likely that the bullet would get stuck in the barrel, you might notice exceptionally slow muzzle velocities, resulting in a poor trajectory and unacceptable performance for shooting small birds, squirrels, and the like. If you have a rifle that is chambered in .22LR, you would be better off buying high velocity .22LR.